Are you asking yourself: “How do I stop negative thoughts?” So did I many years ago and it’s a great question! Many people want to know the answer. Do you? Then keep reading… It is important to learn how to deal with negative thoughts, if you want the Law of Attraction to work for you. And of course if you want to live a happy life in general! Wondering how to get rid of my own negative thinking was a burning question I had for many years in a row. I just couldn’t stop my negative thought patterns. It was really maddening. I often felt desperate and thought it would never stop! It was completely overwhelming. It’s like you can’t stop the inner mind chatter isn’t it? You are aware of the fact that it’s not helping you. You really wish there was a stop button inside your brain. Or at least a remote control to pause them for a while. Sadly there is no such thing available. I am going to support you with great tips that will make you feel so much better! I will show you how you can be your own stop button. You will love the simple process. Your life will change for the better. It is easy and won’t take a lot of time. Are you willing to make a positive change? You are not alone with your negative thoughts! Although it may sometimes seem as if you’re the only person on the planet that is suffering. Know that many other people suffer from the exact same thing. It won’t stop the thoughts, but the idea that you’re not the only one is really comforting. It means you’re not crazy. Never think you are. When I went through this period in my life, I thought I was absolutely insane. How wrong I was! It looks like others are feeling so much better. But in reality this is not true. Many people think negative on a daily basis. Below you see the findings of psychologists who did some research with students of a business school. Although these students thought they were thinking positive in general, in reality they weren’t. It appeared that 60 to 70 percent of the thoughts that occurred spontaneous every day, were negative! Can you imagine! These were young students! The general numbers are even more revealing: in general 80% of our daily recurring thoughts are negative. We repeat our thoughts as well. You may think the same negative thoughts as you were thinking yesterday or a week ago right now. The more negative your thoughts are, the more people you meet that have the same mindset. It is proof that the Law of Attraction works. Like energy attracts like energy. If you think negative, you send out negative frequencies to the Universe. This attracts people (and circumstances) to you that are on the same vibrational frequency. You not only attract people with the same thoughts into your reality. Everything around you looks a bit dark and gloomy. Like nothing can make you feel good, no matter what you do. The more you think: “How do I stop negative thoughts”, the worse it becomes. It’s the way the Law of Attraction works. It’s not a personal thing or so. Your vibration is low when you think negative. The Law of Attraction can’t do anything else, than bring you more of the same vibration. That is why it is so important to keep your vibes high. But you probably already realize this. You are not crazy! There is nothing wrong with your intelligence. But still you can’t stop the thinking patterns and the “negative thought virus” keeps on spreading itself on autopilot. This has to do with your focus. Whatever you focus on expands: you get more of it. For example: If you think: “I don’t want these bad thoughts in my head”, you’re still focused on the negativity. The Universe does not understand the word “no” or “not”. It simply responds to the vibration you are in and brings you more of that same vibration in return. Remember that everything is energy. Your thoughts are no exception to this universal rule. Your thoughts are energy too. They vibrate. They have a unique frequency. It’s not the words but the feeling behind the words that count. The Law of Attraction responds to what you really mean. If you’re worried and/or anxious, it has no other choice than to respond with a physical manifestation, that matches your worried/anxious vibration. Even if you state what you want in a positive way. 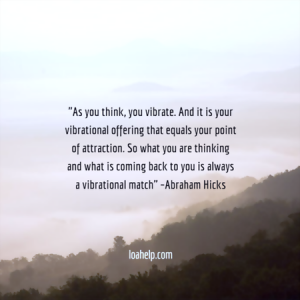 The Law of Attraction simply picks up your vibrational frequency. Why do I think so negative? Time for clarity! I have never met people that are meditating and ask the Universe: “Please bring me more of these yummy dark, somber thoughts and feelings, I love them so much…” And I am almost 100% certain that you don’t do this either. It has nothing to do with willpower. If that were the case, you would already be a happy thinker. I am also pretty sure that you really understand, that negative thinking won’t brighten up your day. But still you can’t stop it. No matter how hard you try. Once upon a time you arrived on this planet as a cute little baby. Your subconscious mind was open to all impressions and learned about what life is all about from the adults. Especially the first 5 years of your life are important. You absorb all information and your subconscious mind believes all it hears. If you’re interested I explain this in more debt in this article about reprogramming the subconscious mind. The subconscious programming from your childhood is still working. That is because most people are not aware of the fact they do have this programming in the first place. You couldn’t help it, that you were programmed as a little child. However as an adult you can. In 99% of the cases, negative thinking patterns have their roots in your early childhood. 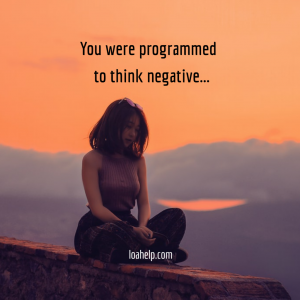 But the moment you understand that negative thinking simply is a (subconscious) program running in the background, you have the option to rebuild that program into something you like better! It may sound simple and it is. Maybe you heard it all before, but what did you do with this information? Are you practicing it? Do this till it’s quiet in your mind. Don’t give up. It might be hard in the beginning, but please hang on. You can do this! Even if it takes an hour. It’s worth it. You will feel so much better afterwards. If you want to change negative thinking patterns and replace old programs, it’s important to be grateful for them! Maybe you’re a bit confused now and scratching behind your ears. I understand this! Let me explain the importance and why you should practice gratitude for the negative thoughts you have, no matter how bad and/or ugly they are. They tell you something is not aligned with who you really are. They initiate negative feelings that match the vibration of the thought. This feeling also comes as a messenger. When you’re aware of the thought and/or feeling, it offers you the opportunity to change it into something that feels better. That is awesome! You are not grateful for the thought itself, but for the opportunity the awareness of the thought offers you. Every time the negative thought occurs, say: “Thank you for letting me know something needs to change”. Thank your inner wisdom for bringing it up as a beautiful sign. When you have the power to think negatively, you also have the power to reverse it. Say: “Wow!” to your amazing potential to reverse your thinking pattern! 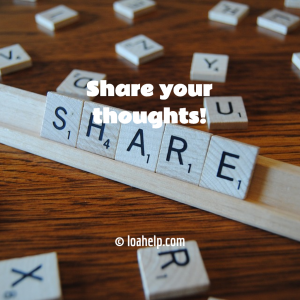 How do I stop negative thoughts step 3: Create an Intention! So your negative thought popped up. You did the shaking process, and you took time to feel gratitude for the opportunity to change the thought. Now it’s time to offer some delicious good feeling vibes to your subconscious mind. You do this by creating intentions. Your subconscious mind has no resistance to intentions, if you state your intentions in a certain way. Let’s say you think a thought about not being good enough. Something like: “I hate myself for doing this or that…” So you offer gratitude for the fact you also have the power to love yourself. You offer an intention: “I want to feel good about myself” or: “I want to love myself”. Always set a positive intention! Never state anything like : “I don’t want to feel bad”, instead say: “I want to feel better”. Intentions always start with: “I want to….” (fill in the blank) After you created yours take a few seconds to feel into the words. Really dive into the feeling, open yourself to it. Write your intention on a piece of paper, carry it with you and reread it as often as you possibly can. This is a great reminder for your subconscious mind. Your subconscious has no problem with intentions. That’s why they are better than affirmations. An affirmation would be like: “I feel great”. But this doesn’t work when you are overwhelmed with negative feelings and thoughts. Your subconscious will resist it, because it doesn’t believe it. So the first step to change is always working with an intention, because an intention feels better. 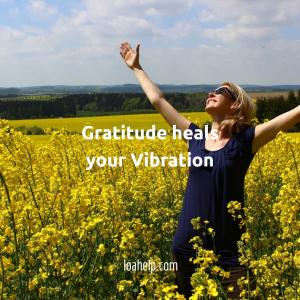 When you feel better, your vibration changes and so do your thoughts! That is a universal law. It always works! 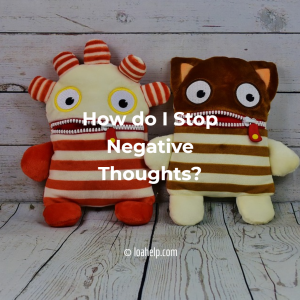 How do I stop negative thoughts? Bonus tip! Before I leave you, I have a bonus tip for you. I realize you can’t always do the exercises above. For example when you’re at work or driving your car. Whenever a negative thought pops up in your mind, just say out loud (or in silence): “This is not the truth about me, I am Love, Peace and Joy, next thought please!” Repeat this process until the negative thought is gone and you think better feeling thoughts! How do you stop your negative thoughts? There are many more ways to deal with negative thoughts. I would Love to hear how you deal with them. Share it below in the comments. Do you have any recommendations? Were the suggestions in this article helpful to you? Do you have questions? I Love to support you and clarify anything that’s on your mind today. There are no stupid questions! Please don’t be shy to ask me anything. Dearest Anja! I feel as if I can give you a hug! This really was such a helpful article and your caring and kindness shines through the words on this page. And although most of the points that you mentioned, are things that I already knew, yet, somehow you said it in such a way that I walk away with a clearer understanding and a feeling that indeed it will be easier to get rid of any left-over negative thoughts. Hard to explain and I don’t know why it feels so much more achievable? I think it is something with your caring writing style. I believe we laugh far too little and we take life (and ourselves) far too seriously. Hi dearest Sharlee! Thank you so very much for sharing your beautiful thoughts with me and for your great tip on forcing yourself to laugh. I mention laughing as a good medicine by the way in this article about how to change your vibrational frequency. And I have used this technique too throughout my own life, many times. It always worked great. What I also do a lot is smiling, as much as I can. This is also great to lift your mood and break the cycle of negative thoughts. They are only thoughts, probably not even your own, yet so many give so much energy to them. What we focus on becomes our reality. It is simple, but not always easy to apply. We’re so programmed to think negative. It’s a subconscious habit. A program running on the background that is always the winner of the game. So we need to reprogram that by offering new, better feeling thoughts. New programs. I am deeply grateful this article was helpful to you. Please let me know if you have any questions and/or wish to share. Feel free to comment again any time. I love hearing from you! Wow, I love the article. It’s such a powerful article that I believe everyone should read. There are people that I know and that I have worked with that have negative mind. I agree with you that when people start to associate with those with negative thoughts, they will also have negative thought. I used to be so negative, and have changed my mind set to be more positive, and now I see this world whole lot different and I am a much happier person. Thank you for the amazing work. I learned so much! Nice website on how negative thoughts are rooted in our childhood and I really liked the tips on how to remove negative thoughts from your mind as an adult. Hi, Anja! What a great article! Many of us daily struggle with negative thoughts, so this article is very helpful. Thanks for sharing these great tips, Anja! It is a good reminder that we need to surround ourselves with positivity if we want to be happy and succeed. Thanks again! Wow! I’ve honestly never seen something more helpful in terms of negative thinking! Thank you so much for the amazing article! interesting read. It’s giving me things to think about. When I get negative thought. I try to other things in order to change my subconscious. I will take some good tips. Great post. We as a society have almost become programmed to think negatively. I tend to think it’s generational. I catch myself saying and thinking things I heard the adults in my life say before. This is a great article for those of us who have decided to break the cycle but don’t know where to start. Hi Colette, thank you so much for your kind compliment and for sharing your wise thoughts. You’re right that these things are generational. The moment you’re created you not only get the physical DNA of your parent, but also their thoughts, beliefs, etc. They are planted in your subconscious mind, that is, till the age of 5 years, wide open and absorbs everything the adults tell the baby. So yes, if you don’t do something about that, you will repeat the program that was putted inside your mind. Thanks Anja for these tips. Questions: How can we stop negative thoughts of a partner? Hi Driss, You are so very welcome. I hope the tips will work great for you and I know they will. I applied all of them in my own life and they were change makers! In answer to your question: You can’t change the thoughts of others, not from your partner, not from anyone else. People have to come to a point where they have an insight, where they understand the thoughts they think and their attitude, can be changed. From that moment they can start learning, like reading the articles on this website. But it must come from their own initiative, otherwise it won’t work. I can’t change you either, and so can’t your partner. We have a free will and that is a fantastic thing. Thanks so much for this post it is true it is so simple to keep giving ourselves a hard time – your advice and insights in how to deal with this are truly valuable thank you so much for sharing your knowledge with me. Hello Anja! What a thoughtful helpful post! I really appreciate how caring and lovingly you present the concept of helping ourselves. You give some really great suggestions. The older I get the more I realize we are our conscious thoughts only as we choose to be. It is about the choices we choose and the way we decide to implement them. For instance, a thought is nothing more than something that comes into our consciousness, it does not belong to us. So in the long run, there does not need to have any attachment to the thought, as you have shown. And finding our true inner core, is not about our thoughts. It is about our heart. Will you be writing more articles about the choice of our lives? Hello Ariel, thank you so much for your sweet, kind words. They were heartfelt and I appreciate it so much you took the time to share your wonderful thoughts with me! You have gained a lot of wisdom yourself and I admire that! It’s wonderful to realize that a thought is just a thought, it’s indeed not even ours, it’s all programming! And programs can be changed just like that! But it takes some discipline to change it. If you have the will and motivation you will be successful and a new world opens the doors. A world full of joy and possibilities! I will definitely write more articles in the future about important choices in life and the fact that we have the ability to choose what we want. I will be writing a lot about changing those programs, because these programs are the cause for many people, that the Law of Attraction doesn’t work in their favor. The Law itself always works and responds to our vibration. So if we want to be aligned with the Law of Attraction, we need to change our vibes. This is the core cause for many why they can’t manifest what they want. It starts all in the mind, thoughts come first and our subconscious produces feelings about that thought. Together they create the vibration and this happens in a matter of seconds, really fast. Too fast to be aware of. It’s about who we really are at a Soul level, I totally agree and will write a lot about that as well. It’s all part of the puzzle. The pieces together create a whole! This is worth reading and meditating on. This will truly set all visitors to this site free. Actually, someone said thoughts become things so we have to be careful what we think on. Thanks a bunch Anja and keep up the good work helping humanity.